One of the features of the pre-romantic age is the mixture of sacred and secular elements in culture, including music. Everyone knows that Johann Sebastian Bach used secular music for his sacred cantatas. Sometimes one finds secular and sacred elements in the same piece, for instance in the wedding cantata Meine Freundin, du bist schön, by Johann Christoph Bach. One way in which sacred and secular music came together was the practice of contrafactum: the substitution of one text for another without substantial change to the music, as New Grove defines it. One of the best-known contrafacta is the chorale O Haupt voll Blut und Wunden, which is included in Bach's St Matthew Passion but whose melody was originally written for a love-song by the late 16th-century German composer Hans-Leo Hassler. The use of music for new texts tells us something about the popularity and appreciation of the original music. The madrigals by Claudio Monteverdi were also the subject of this practice of contrafactum. How much this was inspired by admiration for Monteverdi's creations is expressed in a letter by the Angelo Grillo, a poet and Benedictine monk from Montecassino who is quoted in the booklet to the present disc which is largely devoted to contrafacta of Monteverdi's madrigals. "Given that these works called for great deliberation and preparation, my monks pondered over them constantly before allowing me to hear a single part and, whilst my heart was enraptured by the delicacy of the harmony, my intellect was delighted by the originality of the language." Obviously the very fact that monks studied and sang those madrigals proves that there was no watershed between the secular and the sacred at that time. Moreover, Grillo himself was the author of love poetry, albeit published under a different name. The contrafacta on this disc are taken from two sources, both collections of madrigals with new sacred texts in Latin - which made them usable in the liturgy - or spiritual texts in Italian, to be used in domestic circles or in convents. These contrafacta were the work of Aquilino Coppini, professor of rhetoric at the University of Padua, and were published in Milan in 1607 and 1609 respectively. He chose madrigals by contemporary composers, and especially from Monteverdi's fourth and fifth books and wrote new texts with the music remaining unaltered. This was certainly not an easy task. "[He] expressly created new Latin texts and took care to ensure that their formal and rhetorical mode of expression would not be in conflict with the original poems." However, that was not the only thing to care about. The structure of the Italian verse also had to be kept intact and because of the close connection between text and music in Monteverdi's madrigals "the spiritual versions needed to reproduce a comparable emotional intensity at the right moment, with expressions varying from the bitterest grief to an uncontrollable joy." If one listens to the madrigals included here one has to be impressed by Coppini's skills in achieving these goals. They sound as if the music was originally written for these texts. Time and again there are striking examples of textual elements eloquently illustrated in the music. An interesting point is how this practice was received, by the ecclesiastical authorities and by composers whose compositions were used. Marco Bizzarini, in his liner-notes, reminds the reader that the Council of Trent had decided that all secular elements should be banished from the liturgy. Coppini was able to obtain the support of Cardinal Federico Borromeo, the archbishop of Milan. His reasoning is quite inventive: he "subtly pointed out that there were also many Christian churches built upon pre-existing pagan temples and suitably reconverted." As far as the composers are concerned, at least in the case of Monteverdi no objection against this practice is known. That is confirmed by the fact that he himself followed this practice when in his collection Selva morale e spirituale of 1640 he included a contrafactum himself: the Pianto della Madonna is a reworking of his famous Lamento d'Arianna from his now lost opera Arianna. It makes much sense that the disc opens with this piece. The Lamento is a piece for solo voice which Monteverdi later arranged for five voices and included in his sixth book of madrigals of 1614. This was the basis for the polyphonic version of the spiritual contrafactum of 1640, created by the ensemble and recorded here for the very first time. It is to be hoped that this version is going to be published, because it would be a really great addition to the repertoire, especially that for Passiontide. Although not all the pieces are connected to this period of the year, the suffering and death of Jesus is a kind of thread in the programme. Stabat virgo Maria is comparable in content to the Stabat mater; it is a contrafactum of the madrigal Era l'anima mia from the fifth book. Mary is also the subject of Maria, quid ploras: "Mary, why are you weeping at the sepulchre?" Ecco Silvio from the same book was turned into Qui pependit in cruce: "He who hung upon the Cross, my God, may he free me through his power". Qui pietate tua also refers to Jesus' suffering at the Cross. Tu, Iesu Christe is about the fruit of Jesus' Passion: "To give me life you were wounded, (...) through your death you, Christ, have delivered me". Rutilante in nocte is a piece for Christmas: "In the ruddily-glowing night choirs of angels joyously rejoice". Pulchrae sunt genae tuae has its origin in the madrigal Ferir quel petto from the fifth book and has received a text strongly inspired by the Song of Songs: "Beautiful are your cheeks, my beloved, my sister, my bride". The rest of the programme is filled with original sacred works from Monteverdi's pen. The motets, for five or six voices and bc, are from a collection which was edited and published by Giulio Cesare Bianchi, a cornettist who for ten years worked at the court in Mantua where he was Monteverdi's colleague. These motets are among the best-known sacred works by Monteverdi, and are frequently sung by chamber choirs. They are written in the stile antico but include the traces of the modern concertante style, especially in the connection between text and music which is strongly emphasized in the performance by La Compagnia del Madrigale. In the opening lines of Domine, ne in furore tuo, for instance, there are some striking dynamic contrasts, much stronger than in performances that I have heard before. The ensemble's approach makes them much more exciting and expressive. The disc ends with another piece included in a collection published by Bianchi which was entirely devoted to Marian pieces. The Letanie della Beata Vergine is for six voices and bc. Monteverdi doesn't follow the practice of other composers of dividing the lines into two halves to be sung by opposing groups. Not every invocation is followed by an "ora pro nobis". Mostly Monteverdi sets this phrase once, closing a group of connected invocations, for instance those beginning with "mater" or "virgo". Several discs by this ensemble have been released and so far I have heard them all. Every one of them was a winner and in my view La Compagnia del Madrigale is the world's best ensemble for this kind of music. It is impressive how well the voices blend without any of them losing its individual character. The text and its affetti are always in the centre. The dynamic control is impressive; one doesn't hear that often the tool of the messa di voce so incisively being used as here, for instance in Stabat virgo Maria. As I already indicated, the polyphonic version of the Pianto della Madonna is very important and it receives a brilliant and highly emotional performance. Never the emotions in these pieces are exaggerated; the expression is always carefully balanced. 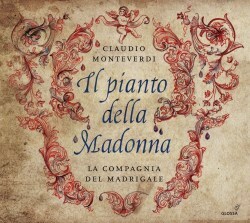 This is a splendid disc which offers something of a new perspective on parts of Monteverdi's oeuvre.